Science Foundation Ireland (SFI) has been analysing data on application success rates by gender. This has allowed us to monitor the effectiveness of our gender redressing initiatives and examine gender balance across SFI’s portfolio of research awards. In support of SFI’s commitment to the transparency of its review processes, we present 2 interactive dashboards representing analyses of gender disaggregated data across a cohort SFI Funding Programmes from 2011. A full data description can be found in the data summary. The analysis contains 2 dashboards below. 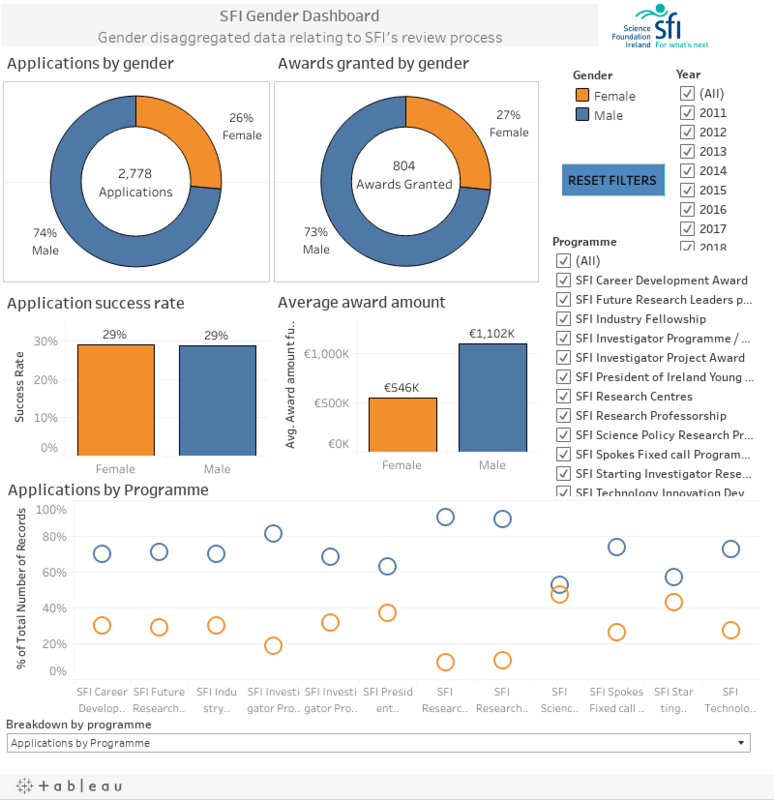 The SFI Gender Dashboard which includes the number of applications and awards granted, success rates and average award amount by gender, and the Funding Analysis Dashboard which shows the average total amount requested in applications and the average award amount, by gender. To navigate each dashboard, please select the year and / or programme from the options on the right-hand side. To directly compare different programmes on the SFI Gender Dashboard, please choose from the drop-down menu at the bottom of the dashboard. To cancel all filters, please click the reset button on the right-hand side of the dashboard. The data presented as part of the SFI Gender Dashboard is available to use free of charge and licensed under the Creative Commons Attribution (CC-BY) Licence. Please refer to the data summary for a full description of these data.